Andy (Martin Freeman) and Thoomi (Simone Landers) work together to keep a baby girl alive in Cargo. I almost didn’t finish Cargo. I was sure it was going to give me nightmares. It’s about fathers and daughters doing terrible things to keep each other alive. But its terrible events lay on top of a premise too tantalizing to turn away from. 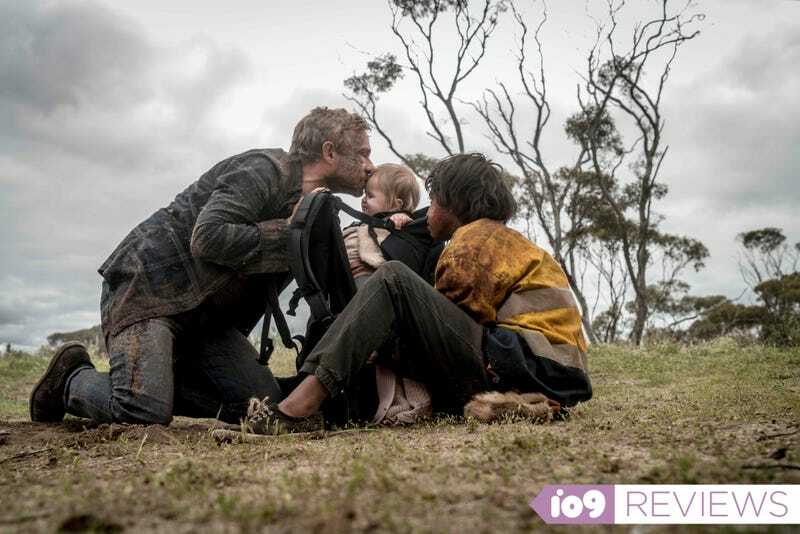 Cargo’s main character is Andy (Martin Freeman), a father who’s trying to survive a viral zombie epidemic along with his wife Kay (Susie Porter) and infant daughter Rosie. They’ve been making their way scrounging and scavenging through the detritus of the world that was, each with a seeming affinity for certain roles. Rosie likes Kay better so she takes care of most of the childcare, which leaves the foraging and procuring to Andy. They’re a team but there’s mild tension and disagreement between the two. The plot in Cargo pivots on two moments of monumental stupidity. The first happens when Kay goes to a boat Andy has previously found food and supplies in. She gets bit by a zombie in the close confines of the cabin, setting her down the inevitable path of becoming a “digger” herself. The second terrible decision is Andy’s: He refuses Kay’s choice to be abandoned so she won’t hurt Andy or Rosie after she turns into a digger. He loads her into a car in a desperate attempt to reach a hospital that might be able to help them somehow. On the way there, she turn into a full-fledged digger and bites Andy. The bulk of the film is about Andy’s search for someone to take care of Rosie before his time as a lucid-thinking man runs out. As I watched Cargo, I struggled with those moments of stupidity for awhile. Was Kay’s choice to go back to the boat borne out of a desire for parity with her husband, since she’s better with the kid and he’s better at foraging? Was Andy’s decision to push on toward the hospital just denial and/or love? The characters’ stupid decisions only made any kind of sense to me after recognizing that Ramke and Howling were invoking the specter of Australia’s colonial history in Cargo. Once I thought about Andy and Kay clinging to the idea of having power of this land and ultimate agency over their own lives, their dunderheadness was easier to swallow. It’s not a stretch to read Cargo in terms of race; the diggers bury their heads in the sand and darkness so they can sleep, hence their name. That habit doubles as a metaphorical device for not acknowledging the erasure and genocide that befell aboriginal people. “They sensed it, those who stayed connected,” she adds. That moment complements another scene where an occult-sensitive “cleverman” comments that fracking and environmental abuse are unleashing sickness across the land. Cargo is heartbreaking to watch. Andy’s grief smashes against the ticking clock of his remaining humanity in awful ways, often putting Rosie in heart-stopping danger. Thoomi’s hardships resonate even more because she’s a young person inheriting the consequences of adults’ bad actions in both the distant and near past. The idea of the zombie myth, as discussed by Tananarive Due and other writers, evolved as a response to white fear of native populations that imperial powers encountered across the world. There’s no escaping the notion that Cargo is a white-guilt horror movie, a work made to grapple with and possibly expunge the psychic residue of the awful mistreatment of the aboriginal people of the Australian continent. There’s some essentialism in Cargo but it’s leavened by this central tension, which is a reminder that there was an aboriginal culture before the colonialism that erased it. For all the wonkiness of its character choices, I liked Cargo because it’s a movie that says, elliptically, that colonialism screwed up the lives of indigenous people. More jarringly, Cargo says because of that original sin of erasure, the descendants of colonialists are reaping what they’ve sown in this horrible end-of-days. More than a century ago, aboriginal children of the Stolen Generations in Australia were taken away from their native lands to be re-educated. There’s bittersweet irony in the fact that Rosie’s future lies in her father giving her over to aboriginal people.